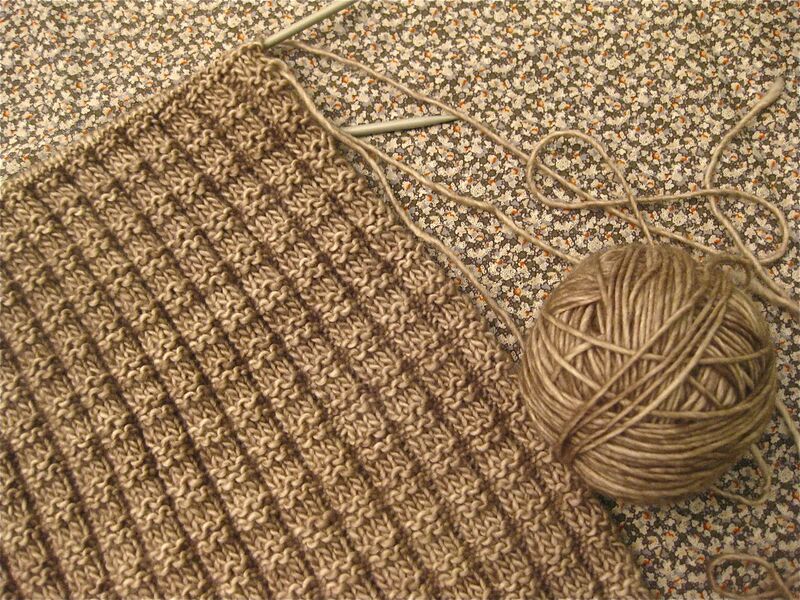 This knitted vest is a special work-in-progress. My 96-year-old grandmother, who lives in England, was an amazing knitter. She always had a project going and could knit anything: lace, fair isle, and gorgeous Aran sweaters. I remember one morning when we were visiting my grandparents, I asked Grannie to knit a dress for my favorite doll. Later that day she had finished a pretty red dress to my specifications, and I was in awe. She also taught me to knit. My grandmother’s eyesight is too weak to knit anymore, and a year ago she sent me some of her favorite knitting patterns–including this vest pattern. It’s pretty well worn, so I know it’s a tried and true pattern. I am using Madeline Tosh merino DK, which is wonderfully soft. The color is one of my grandmother’s favorites, and I know this will keep her warm during England’s damp and chilly winter. I am rushing to get this finished so my mother can take it over when she goes to visit in about a week, so my sewing has mostly been on hold. But, I am getting a little work done on the binding of my signal flags quilt. I had the tiny buds fabric used for the backing in my stash. I really like the delicate print contrasted with the strong geometric front–and the colors are perfect. This entry was posted in knitting and tagged Knitting, Madeline Tosh, vintage knitting pattern on October 23, 2013 by brigitdermott. Do you happen to have the pattern for this knitted jem!?? It is one of my grandmother’s old patterns probably from the 60s. 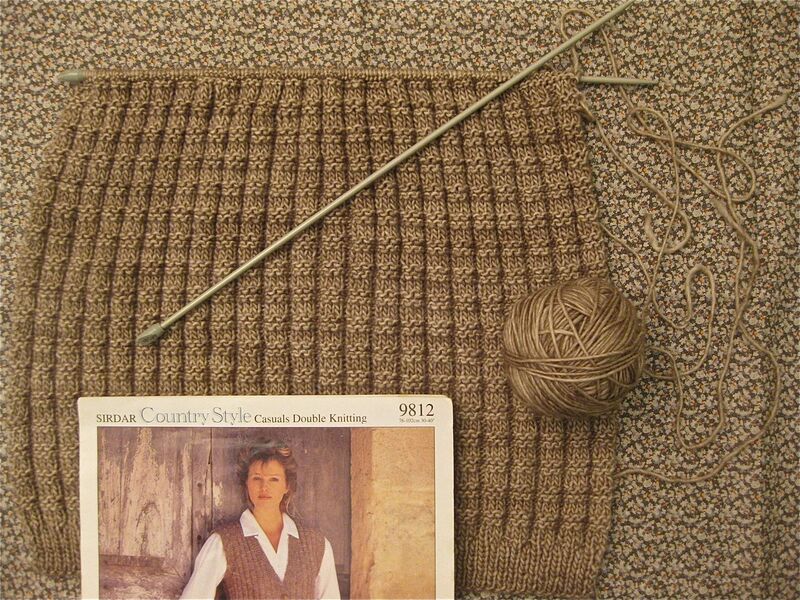 The publisher is Sirdar and the pattern is #9812 if that is helpful! Love the progress on the vest and the color is great. Do you hand sew your bindings down? I’ve seen a lot of machine stitched bindings of late….not sure how I feel about them. 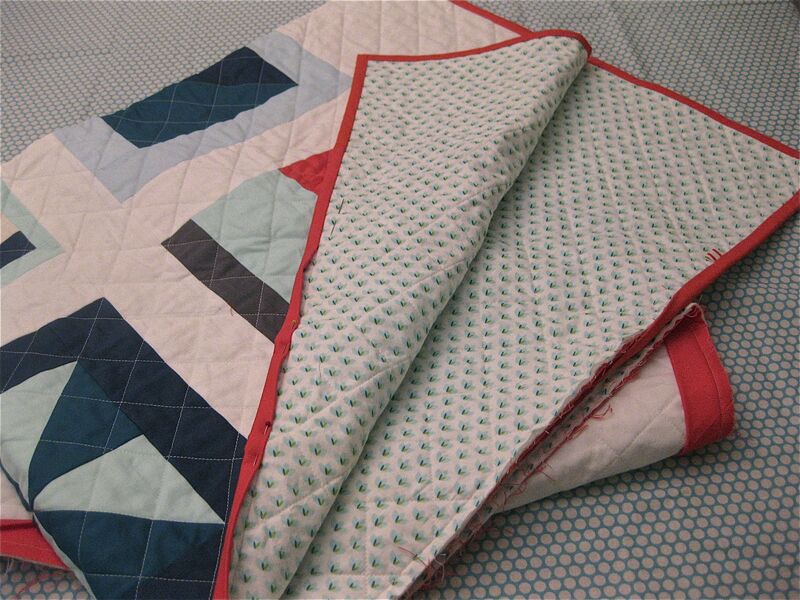 I do a handsewn double binding for all my quilts. But I did just try machine stitched binding for some placemats. I found a technique that I like pretty well–its neat and not fairly light, which is good for a small project. I wouldn’t use it for a quilt in part because I like handsewing and also because I really like the invisible stitching of a hand sewn binding. I did a post a few weeks back about machine binding if you’re interested!